Marie Kondo’s well-timed new Netflix series Tidying Up with Marie Kondo has kicked off the year with a bang for so many people who are ready to let go of the items that do not “spark joy” for them any longer. I have never seen such a response in this field that has so many influencers on social media singing the praises of the Kon-Mari method. I understand this feeling on a larger level because of all of the homes I have helped declutter, purge, organize, unpack and set up systems for over the past 6 years. This problem goes super deep and I’m not going to stress you out with everything I could share. What I’d like to do is start a conversation with some of the things we can all do right now that are simple and have the greatest positive impact on our environment. We can’t simply do a 180º and expect to all follow a zero waste plan. We also can’t spend weeks trying to dispose of all of the items that should never be in the landfill, it’s not realistic. Starting this Saturday, January 26 at 12pm EST, I will be going live on my Facebook page each week to discuss the simple solutions we can implement to help us not only declutter our homes but also keep the discarded items going in the right direction. With the change of seasons here on the East Coast, it’s a sloppy time of tank tops and flip flops navigating with sweaters and boots. My closet can become as eratic as the weather if I don’t have a plan. While most people say they like change, the reality is they don’t like the sloppy steps it takes to get there. I see the blind eye people cast upon their messy closet. A shopping spree ensues instead of transitioning and eliminating. By embracing the changing of the seasons as an opportunity to get ahead of the chaos, we are in control. It’s a time to review what we wore, delete what’s outdated and know what our true needs are to round out our fall wardrobe. 1. Nothing is forever: Well, diamonds I guess, but that’s generally not the quality of items you need to wade through to organize a closet. It’s amazing to me how quickly the items that were so important three years ago, and sometimes only three months ago, are no longer meaningful now. You can’t trust that the way you felt in the past is the way you’ll feel forever. When you understand your own cycle of change, it becomes easier to release what’s no longer serving you. This is why it’s so important to go through, look at and touch it all, and see where your feelings have changed. 2. We are constantly evolving: The resistance that comes with going through our wardrobe is that we are forced to face our poor choices head on. It’s understandable to want to avoid this, but if we can work objectively, and investigate without judgement, we will see our shopping patterns. Who you are now is not who you were a year ago. If we study our layers of stuff, we can start recognizing our patterns. You may be surprised how this information helps you resist future impulse purchases. It’s a perfect moment to identify what becomes meaningless over what period of time. A year, a week? This is the first step to start recognizing waste before you bring it home. 3. Create the change: While it may seem easier to avoid this work altogether, you’ll need to face it at some point. Better to schedule an afternoon to take stock than to realize as you’re already late for work that the sweater you suddenly need because the temperature dropped overnight is now stretched out and ill-fitting. Yes, it takes an investment of time, but that time is on your terms, rather than creating stress when you least need it. 4. Let’s do it together! : Join me live on FB this Sunday, September 23 from 2-4pm EST and I will show you exactly how I change over my clothes and will answer questions live throughout. This will be a great way to hold each other accountable and learn strategies going forward to help you stay on top of this in the future. The only requirement is that you do all of your laundry before we start! If you haven’t already, like my business page and be alerted when I go LIVE! Looking forward to “seeing” you then! Will you be joining me? Let me know in the comments. Wow! I really took my time with my office project. My pace is usually very quick but balancing my time with editing my book, working with clients and completing my office was definitely a challenge this go around. 1. 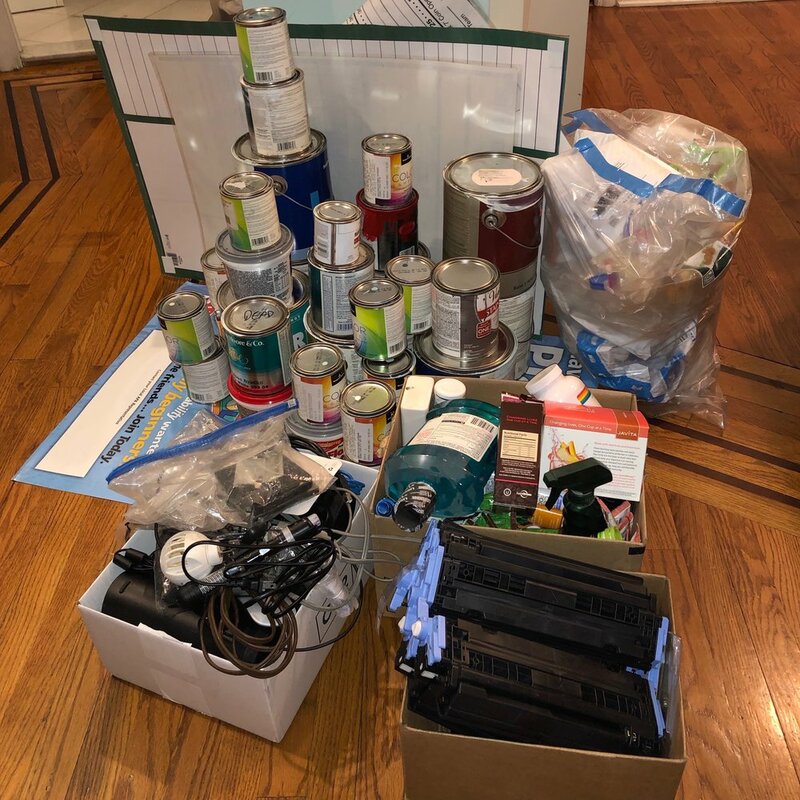 Your vision needs to be clear and inspiring: I started this project because I couldn’t believe how quickly my office had become a dead zone in my home filled with piles of crap. Granted, I had organized piles of crap - and they were absolutely uninspired. I avoided walking into my office because it just didn't feel good to me. 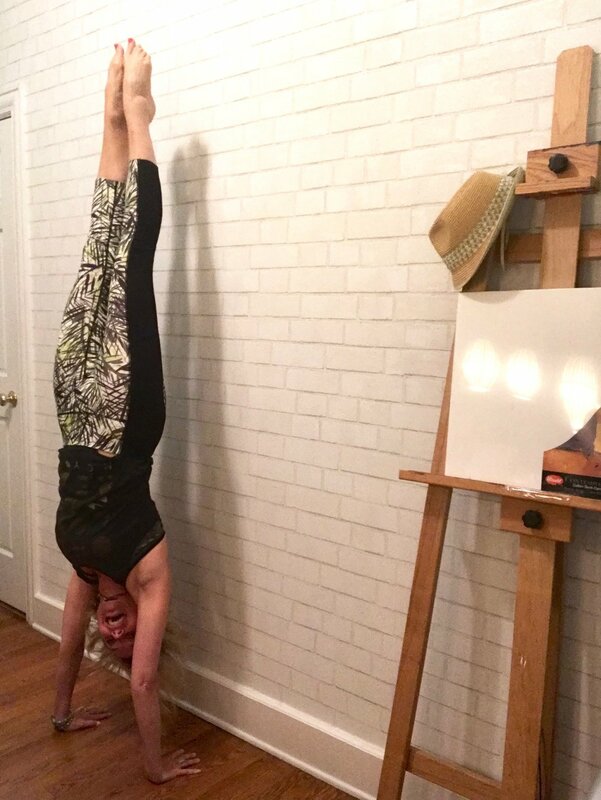 This was the perfect opportunity to walk my talk and look at what was missing from my life: a place to do handstands, a place to meditate, and an inspiring and creative workspace. These were truly important to me and the touchstone to keep me moving throughout the project, even when weeks went by without time to work on it. Your vision doesn’t have to be a picture, it can be a feeling, a memory or even a new way of being. When things get tough or you get off course, remember that everything is ok and keep connecting to your vision. 2. Take it step by step: While planning sounds boring to some, I love it. Sure, I have my moments of flying by the seat of my pants and making changes on the fly; being adaptable is absolutely necessary. It’s also really important to understand the steps needed to get to the end. Getting the project out of your head and onto paper is the first step, and it creates ease. When the next step feels overwhelming, it means it needs to be broken down further. Sometimes a step may simply be to keep going when your amygdala is trying to protect you from the scary reality of change. Talk kindly to it and say, I am safe, change is good. Anticipating and welcoming these steps are signs of progress. I was blocked trying to figure out these shelves and IKEA came to the rescue with their perfect made-to-fit partitions. 3. Celebrate the small victories along the way. As a culture, we are trained to focus on what’s wrong. During a transformation, you have to get through a mess in order to see the light. There is a lot of trust required to get through. If all you can celebrate is that you gave your neighbor an appliance or put a book out on the stoop, celebrate the fact that you were able to let go. It gets easier as momentum builds. Some celebrations may be that it didn’t turn out exactly as you expected. Look for the surprises, happy accidents are part of the fun. The vision and the plan are what help you take action, they are not the absolute end point, merely a direction. Many people get frustrated when they can’t find the exact solution they wanted. Rather than making it (or yourself wrong), expect that something better is on it’s way. 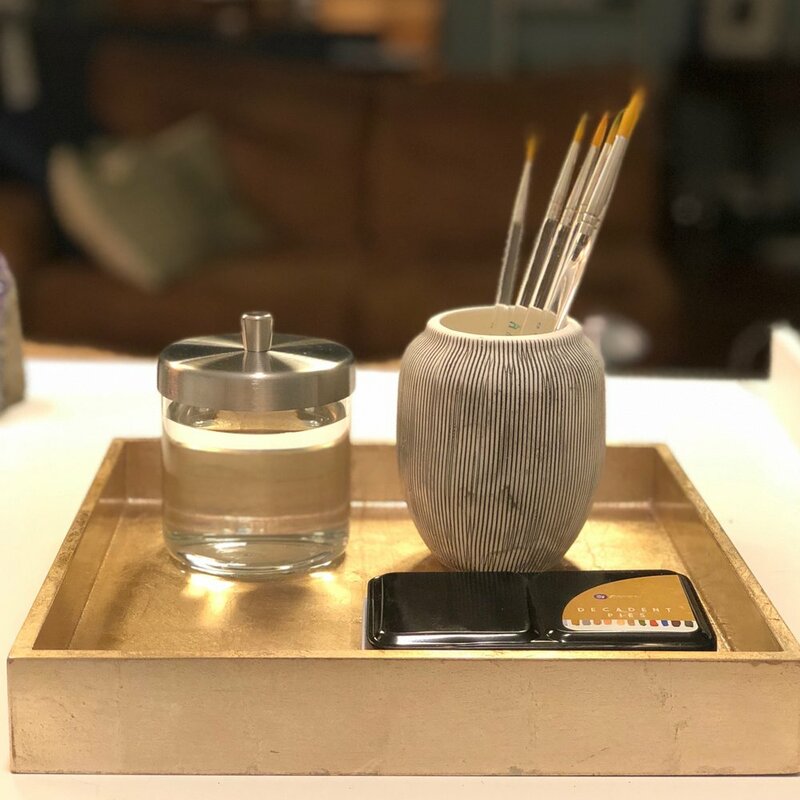 I didn’t plan on this little creative station on my desk, but I became inspired when I was at The Container Store for a meeting and saw this gold tray. The cup for the paintbrushes is technically for toothbrushes and the glass container I found in the kitchen department. Remember to think outside of the box when looking for the proper containers. As I mentioned last week, trays are a beautiful way to create order. This little detail may be may favorite part of the whole transformation. What could clearing some space in your home invite into your life? Please share in the comments! This week I'm talking about my own spring cleaning plans. If you need some guidance, check out our new DIY program, Clutter Clarity, and get your space in shape! Share with us how your spring cleaning is going on the Create Clear Space page. I haven't gone off the deep end, but while watching my new favorite show, those words were uttered. Watch the video to learn more. Have a glorious weekend and come on over to the Creating Clear Space FB group and join the conversation. It seems as though the dog days of summer came early this year. It's been sweltering here in the city, day and night, causing us to need the AC around the clock. We've had a bit of a reprieve this week, but surely August will get us back into the 90's soon enough. 1. 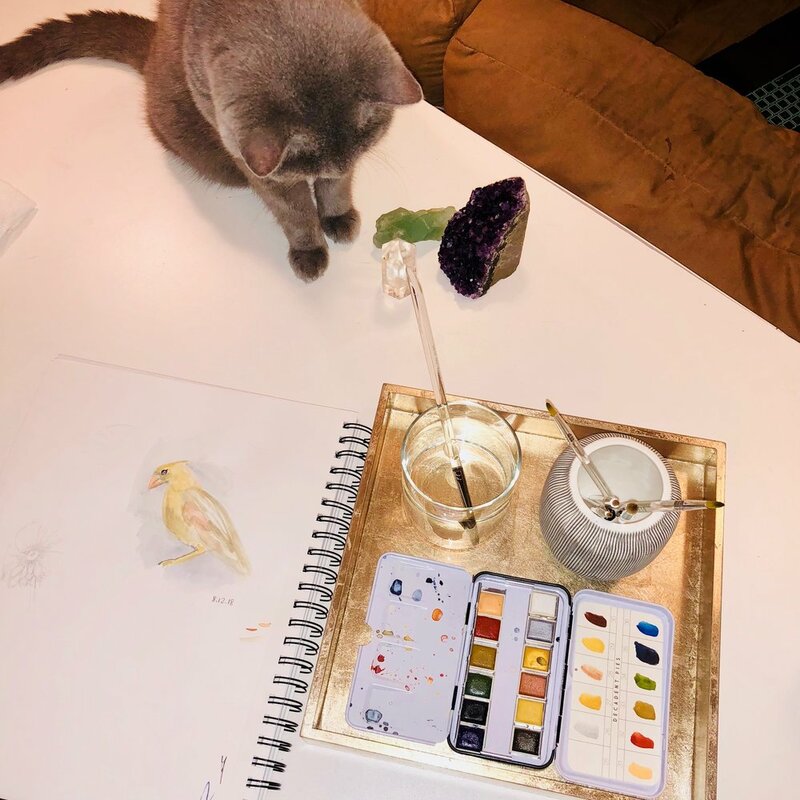 Tackle a Tabletop: Look at the tables in your home—coffee table, bedside table, the table next to the front door—and figure out what needs to go and what needs to be put away. More than likely, it’s unpaid bills, a letter from your Aunt Tina that you’ve been putting off lately, some bits and pieces from your bags and briefcase, or magazines that you haven’t read it. Take the time to junk whatever should be thrown away, file what needs to be kept, and organize what should be there in the first place. 2. Question your Countertops: Similar to the plight of the table, unnecessary items build up over time, often when you are in a rush or are distracted. Think about what should be on your kitchen counter and how often that item is used. If it’s the blender you use once a week or a coffeemaker that’s only given life when there are guests around, put it away! However, if your Nutri-Bullet is the source of your daily breakfast shake, it’s earned it’s spot in the corner of the counter. If you have ten mugs but there’s only two of you in your home, it might be time to reconsider how many you really need. Your counter is a functional space and should be treated as such. 3. Wear Down your Wardrobe: Start with those summer clothes that you haven’t put on once this year—that bikini bottom that maybe showed a little too much for your liking, the pink knitted sarong that you got on vacation three years ago, and everything else that doesn’t fit, is worn out, or that you just don’t care about anymore. Then go over your fall and winter gear. What should be replaced? What doesn’t serve you? If they are still usable, donate them to your local shelter or to a donation center. Remember that while they may not be what you need anymore, they could be perfect for someone else. When you are stuffed with things you don’t need that take up too much room, the heat only increases. By clearing out and removing these unnecessary items you will find yourself feeling at ease and accomplished. I see a lot of paper shredders in my clients' homes and when I ask about where/ when they shred papers, the answer is that they don't. The pile of papers near the shredder is usually the tell-tale sign, but part of my job is to help my clients create an awareness around their behaviors so as to open up them up to transforming that behavior. Personally, I do not like shredders, it's the noise that just gets in my bones and it makes me kind of nuts. My husband does the shredding, and I cringe every time I hear it. I am lucky that he does the shredding because he is organized and keeps up with it. It's not a mound of stuff he has to conquer. While in one of my corporate client's office this week, the topic of shredding came up. The discussion that ensued was very entertaining and eye-opening. I was in one of the executive's office looking for a shelving solution for a nook that was currently storing a shredder with a bunch of stuff piled on top. It was quite obvious that it wasn't being used and he was willing to get rid of it. Another executive, who had JUST told me about how he and his wife recently moved and were so happy to have gotten rid of so much stuff, says, "I'll take it home". My question was "but, will you really use it?" His response: "Ha! You always ask the right questions!" He was ready to talk himself into how satisfying it would be to spend his valuable downtime shredding papers. Who am I to judge that? I get that sometimes doing a physical task that has physical measurable results can be very satisfying when you spend most of your time doing cerebral work. The awareness here I like to implement is for my clients to think about how much their time is worth. Curiosity got the better of me so I called New York Paper Shredding Service to find out exactly how much their service costs. They come to your home or office and for up to 300 lbs. of paper - the equivalent of 10 black garbage bags - it's $119! Now, I don't want anyone to accumulate that much paper to begin with, but I don't see why neighbors couldn't plan once or twice a year to share the cost to simplify this huge project that no one has time for. In a follow up email exchange with my executive, I ended with ::DON'T TAKE THE SHREDDER:: His response: "My temptation for shredding has subsided ;)"
Years ago, prior to starting my current business, a dear friend of mine commented on how I was an "eliminator". She was speaking about my food choices and I see now how that has crept into every area of my life. I've always been a picky eater and would never try something if I didn't like the looks of it, including childhood delights, like a fast food hamburger. That was mostly about the smell of it, and as an adult, I am grateful to have never introduced it to my diet. Over the past few years, I've started challenging myself when I felt resistance to giving something up. I would have an idea and would feel an overwhelming "No, I CAN'T give that up!" Somewhere in those thoughts I didn't like that I felt beholden to these things, so I had to see if I could live without it. What I learned was valuable and has inspired me to take on my limiting beliefs in other areas of my life. My biggest accomplishment, and certainly the hardest, was sugar. I remember feeling sooooo depressed with just of the idea of giving up sugar. That is what really impacted me, that I was allowing something that could rot my teeth and wreck my insides to control my feelings. It's been over 17 months since giving up sugar and the best thing to come of it is my new found appreciation of fruit, a much healthier habit. I'm sharing this with you because I see how this parallels with my dear clients who are struggling with letting go of the items that are overwhelming them. The reason they have called me is that they are looking for freedom. What I have experienced from "giving up" all of these things is simplicity, ease and freedom from the many decisions that have to be made each day. I actually feel like I have more in my life: more freedom, more abundance and healthier habits. Letting go of physical items creates space for many things, mainly space in your brain. I don't come from the standpoint that everyone should give up these things, nor do I think they need to be given up permanently. I challenge you to think about this: what is one thing you think you can't live without? Many people fear not having enough, and believe they don't have enough, especially when they are being suffocated by their belongings. Anytime anything seems too hard, I think about the fact that I gave up ingesting more than 80 grams of candy everyday and if I could do that, I can do anything. It's so empowering. So, please share with me: What is the one thing you are ready to eliminate? The photo above is one of my longtime favorites of my great-grandfather. This was probably sometime in the mid-1920's and as my grandmother once told me, they were in White Plains for the day, a retreat from the city. When I asked why he was chopping down the tree, she said "For exercise! ", like I should have known. How is Decluttering Like Vacation? I know, the title sounds like the beginning of a bad joke, but hear me out, they are quite similar. I love my work, so much so that I tend to overdo things and require some serious downtime to recharge. Last year Ross and I went to the Dominican Republic and I basically passed out for 4 days. I finally was able to walk around on day 5 and then we left the next day. It was what I needed and I came home well rested and with some gorgeous images, always a sign of a great vacation. So how is this similar to decluttering you ask? 1. Just Do It. It's the planning and deciding to put it in your calendar. Once you book your vacation, you are halfway there. Putting things in time makes them happen. This is part of what I do. My client says, "I'm going to bring this packaged food I don't eat any more to the local church". My question is always the same: by when? 2. You know where everything is and everything you have. I've had clients tell me how much they love traveling for business as there are so many less decisions to make each day - this is the goal of decluttering and organizing. Making less decisions. When you know where everything lives and you can put everything where it belongs, it is no longer stressful to clean up the house if someone is coming over at the end of a busy week. This is life, it gets messy. The goal isn't to live in a magazine layout. Make the easy stuff easy and watch how it permeates into the rest of your life. 3. It's not always easy to get there, but the rewards are worth it. When my husband and I go away, we go AWAY. The fewer signs of civilization the better. Those places usually require longer journeys and it's typically a challenge. But to end up feeling like you are the only person on the planet - I'll take it. My clients complain that decluttering is hard, it's long and confusing, but upon completion, we have created an oasis that makes everyday a vacation compared to the daily chaos that greets them each and morning. 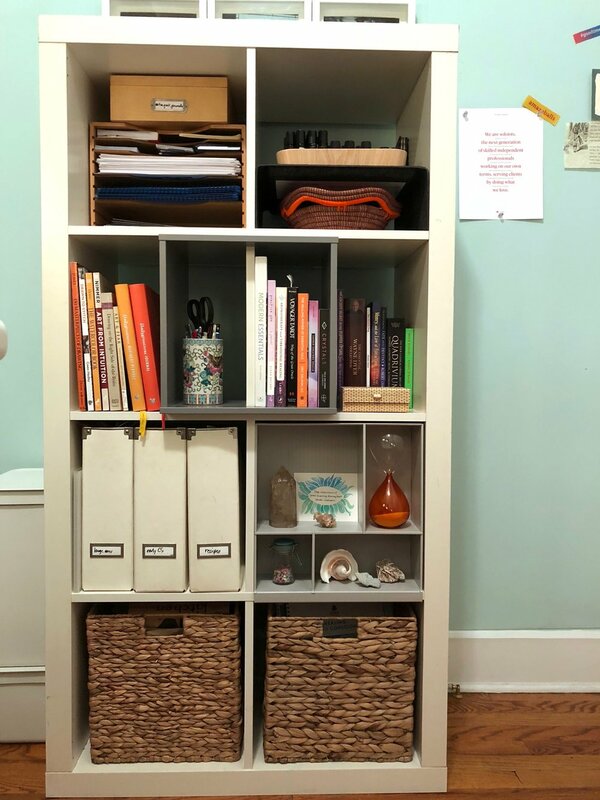 Are you ready to get your clutter gone? By when?